Former national security adviser Lt. Gen. Michael Flynn would like to get it over with and receive his sentence for lying to investigators, but federal prosecutors continue to delay the process. “The government came to us and said they’re not yet prepared to proceed,” Flynn’s lawyer Robert Kelner told U.S. District Court Judge Emmet Sullivan on July 10, Politico reported. 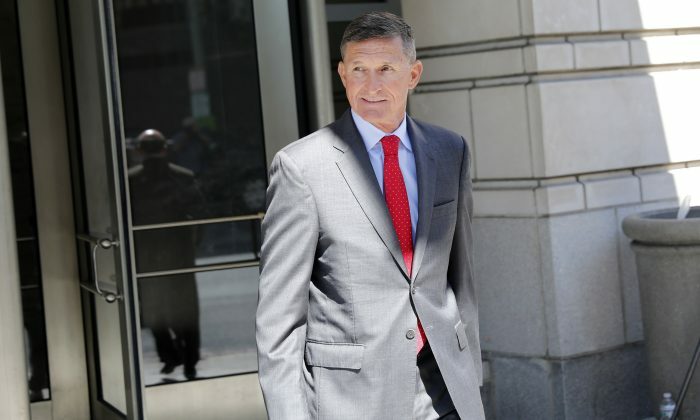 “General Flynn is eager to proceed to sentencing when it is possible [but] with a cooperation agreement, it is really up to the government to make that recommendation,” said Kelner. Flynn is cooperating with Mueller’s investigation, which may be the reason why the prosecutors don’t want his case concluded. Flynn may wait until October or later to get his sentence. In late 2016 and early 2017, as part of Flynn’s transition work for President Donald Trump, he was asked to talk to foreign diplomats to lay some groundwork for future relations. On Jan. 24, 2017, four days after Trump’s inauguration, two FBI agents visited Flynn at the White House and asked to speak with him. “Agents saw no change in [Flynn’s] demeanor or tone that would say he was being untruthful,” according to notes taken by the Senate judiciary committee, which questioned then-FBI Director James Comey about the Flynn interview in March last year. Comey subsequently denied making the statement. Still, Flynn later said that he made false statements to the agents. Specifically, he denied that he had asked Russia not to escalate the situation after then-President Barack Obama imposed additional sanctions on Russia, and that he asked Russia to vote against or delay the vote on Egypt’s resolution to the U.N. Security Council regarding Israeli settlements. Trump fired Flynn from his role as national security adviser on Feb. 13, 2017.